The article shows that during the day as certain temperatures are reached, thunderstorms and cumulus clouds develop which increases the albedo and reflects sunlight back into space, thereby cooling the atmosphere and ocean. Looking for a way to extend Eschenbach’s results it seemed reasonable that data on precipitable water, which is the total amount of water in a column of air, would be an indirect measurement of the amount of cumulus and cumulonimbus clouds in the tropics. Precipitable Water (PW) data is available from the NOAA Earth System Research Laboratory from 1949 to 2014. The data is world-wide at 2.5 degree increments of latitude and longitude. A program was written to extract the yearly average PW for selected latitudes for the period of record. A graph of the results show that in the tropics from 5° N to 5° S the amount of PW decreased from about 1959 to about 1997. Since the precipitable water in this area is primarily cumulus clouds and thunderstorms, it follows that there has been a decrease in such clouds during that period. 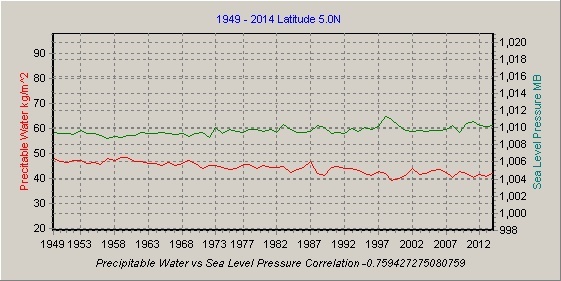 Fig 1 Precipitable Water and Sea Level Pressure for latitude 5.0 degrees north. There was no such reduction in PW north of 5N or south of 5S. There are probably many reasons that could account for such a reduction but a graph of Sea Level Pressure for the same period shows that it could be due to more frequent areas of high pressure providing stable air that is not conducive to thunderstorm development. Note that in Fig 1 the rising curve for Seal Level Pressure coincides with downward curve for PW until about 1997 when both curves flatten out. The correlation between the two is -0.759. It is interesting, but perhaps coincidental, that the period from 1997 is the same period as the current hiatus in global temperature.